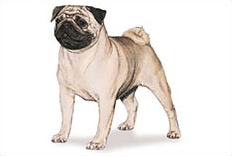 The Pug originated in the Far East but subsequently came to prominence in Europe where he was a great favourite of European high society and royalty. In Europe he was treated as a toy and dressed up in bizarre fashions, while he lived in the lap of luxury. Today the Pug's main claim to fame is as a much loved pet. Extremely friendly, he attaches himself to a household and family with complete acceptance of the fact that he is an essential part of that lifestyle. Although small, he requires no coddling, and his roguish face soon wiggles its way into the hearts of men, women and especially children, for whom the Pug has a special affinity. His overwhelming reason for living seems to be that of being close to and pleasing his folks. In his old age, he becomes very much the rather wheezy old relation, sitting in the most comfortable chair in front of the fire! A delightful dog to own. The Pug enjoys fetching a ball or playing with you, but does not require extensive exercise. Similarly, minimal coat care is needed, although his eyes and head wrinkles need to be regularly checked and cleaned. He can be miserable in hot weather, so keep an eye out for possible breathing problems and make sure he does not become stressed. This dapper little character can be somewhat headstrong, but his impish charm more than compensates making it easy to spoil him, which he naturally accepts as his rightful due!